The original line-up for the Virgil Brothers was to be Rob Lovett, Malcolm McGee and Mick Hadley but just a few weeks into rehearsal Mick left, leaving an opening for Peter Doyle to join the group. Formed along the lines of the Walker Brothers and Righteous Brothers all three Virgils had already proved themselves on the Australian 60s scene. 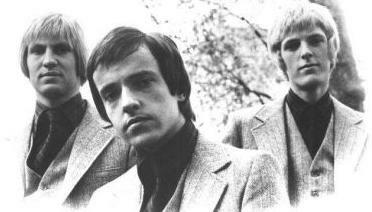 Both Malcolm Mcgee and Rob Lovett had been founder members of the Wild Cherries and both left in 1966, Malcolm joined Python Lee Jackson whilst Rob moved on to the Loved Ones co-writing hits for as well as performing with the group. The group were managed by Lily Brett, their musical director was David Mackay, whom Peter was to work with again, later as a New Seeker. Their musical arranger, Johnny Arthey was also to work on some early recordings for the New Seekers at a later date. Formed early in 1968, the Virgil Brothers spent a long time rehearsing and preparing for the debut with advance publicity provided by the Australian music paper, Go-Set. In May 1968 Go-Set reported that the group had spent four months in preparation, working on their presentation, learning their musical arrangements and perfecting their stage act. In an interview Peter, who at the age of 18, was already being described here as 'Australia's most underrated singer' explained that although all three group members could play more than one instrument, they would not be playing their own backing, another group and orchestra would be providing the music. The Virgil Brothers made their debut on Tuesday 4th June 1968 at the Menzies Hotel in Melbourne with radio station 3UZ on hand to tape the show for a later broadcast. The following Sunday afternoon they appeared at Melbourne's Festival Hall, as Peter had done as a solo artist on many an occasion. They starred with Johnny Farnham and also on the bill were the Mixtures, the Campact, the Rondells and Marcie Jones and the Cookies. The following week their first single Temptation 'Bout to Get Me, backed with I See Her Face received rave reviews in Go-Set from well known figures on Australia's pop scene. Stan Rofe declared it the best Australian record he had heard in his 10-year career as a DJ, Johnny Farnham and Johnny Young both said they had been knocked out the first time they heard it and Jim Keays of Masters Apprentices said that it was a 'very courageous attempt at something new, which is successful. Vocally they are the cream of all Australian talent'. Temptation 'Bout to Get me was a huge success and was quickly followed up by a second single, Here I Am which was backed by Shake Me, Wake Me This second single failed to reach the same heights but Temptation won a major network award as best record of the year and earned the group a trip to the UK under the same management as Cliff Richard. Early in 1969 the Virgil Brothers boarded the Fairstar, a ship which had carried many British emigrees to Australia and delivered much of the cream of the Australian sixties music scene to the UK. Travelling with the Virgil Brothers that year were the Groove who had been the 1968 winners of Hoadley's Battle of the Sounds contest. Arriving in the UK in April 1969, the Virgil Brothers faced a line-up change as Malcolm McGee decided to leave and a replacement, Danny Robinson was flown over from Australia. Danny was also a former member of the Wild Cherries, but he joined the group after Mal and Rob had left. The group's UK engagements included a weekly spot as guest artists for the summer run of the Frankie Howerd Show and also an appearance on Joe Brown's TV show, Set 'Em Up, Joe! Temptation 'Bout to Get Me was re-released but this time the original B side co-written by Rob was replaced by Look Away, written by Peter. In the UK as in Australia the single appeared on the Parlophone label whilst it came under the Tamla Motown umbrella, released on the Rare Earth label in the US and Canada. The third and final single was released in the UK in September 1969. When You Walk Away was co-written by Shadows member Hank Marvin who co-wrote another song to become the title track of Peter's next solo album, Skin Deep, in 1976. The B side was Good Love. 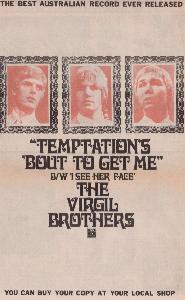 By this time, the Walker Brothers and Righteous Brothers may have been legends but they were also history, the pop scene had moved off in another direction and the true talents of the Virgil Brothers abroad went unnoticed. The group split and the members went their seperate ways in early 1970.